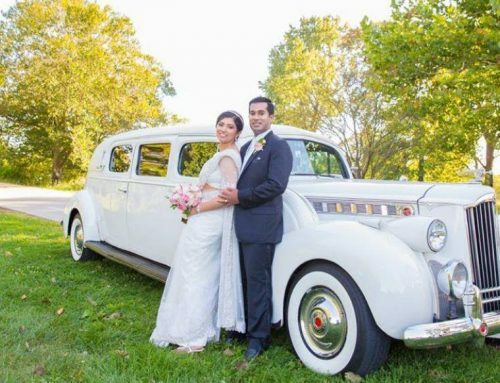 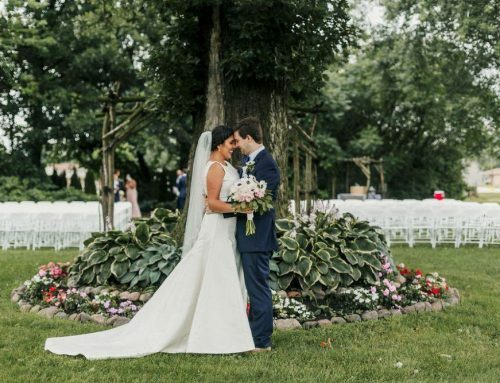 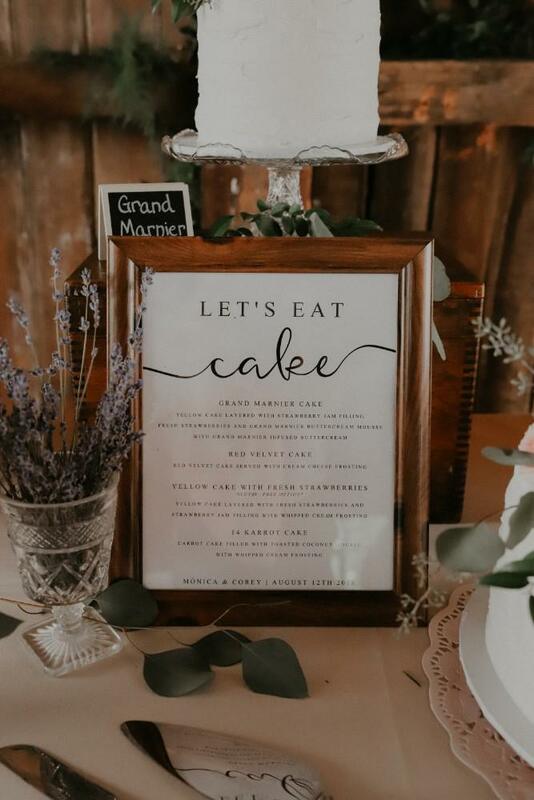 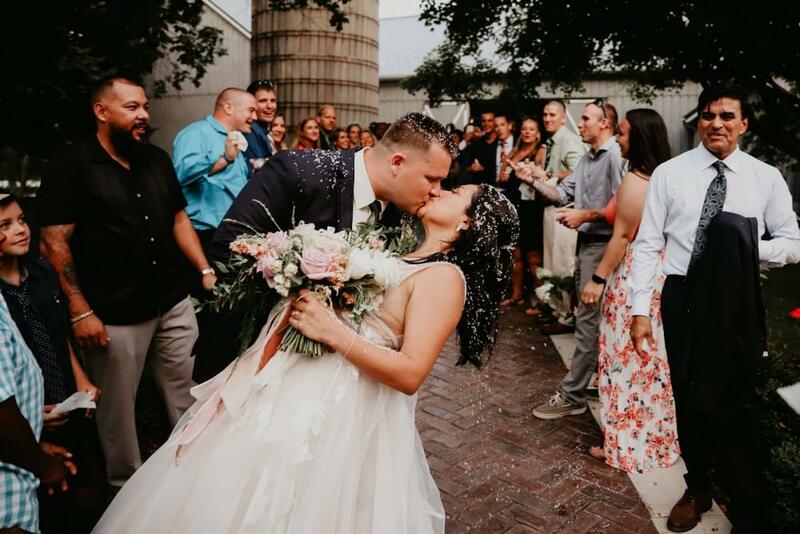 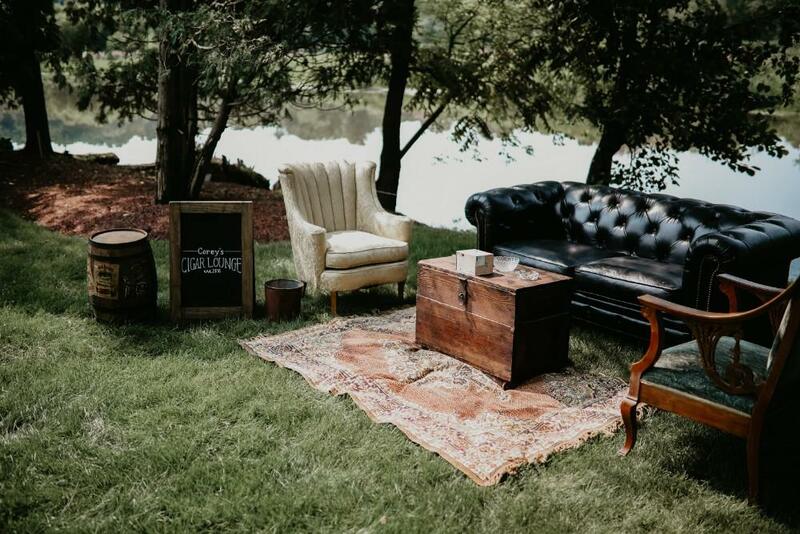 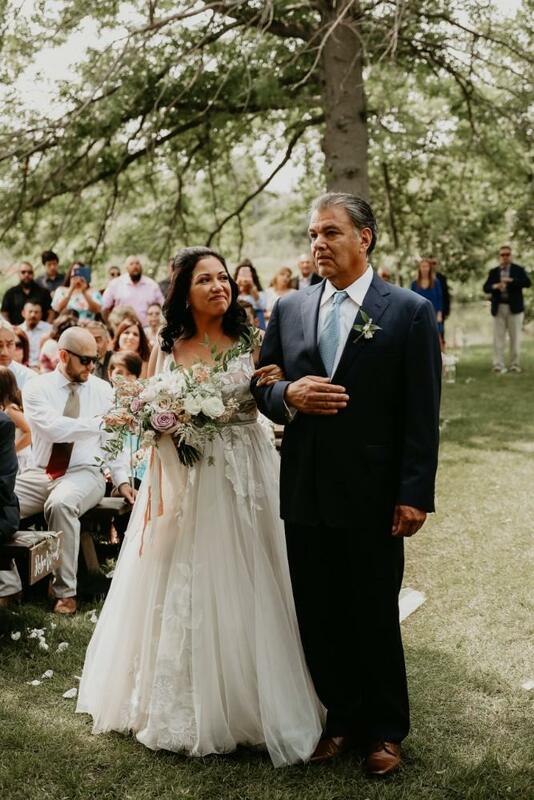 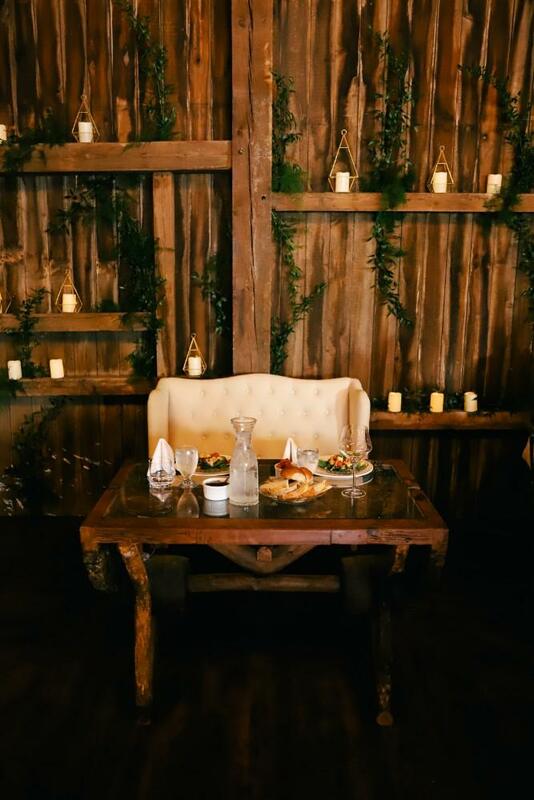 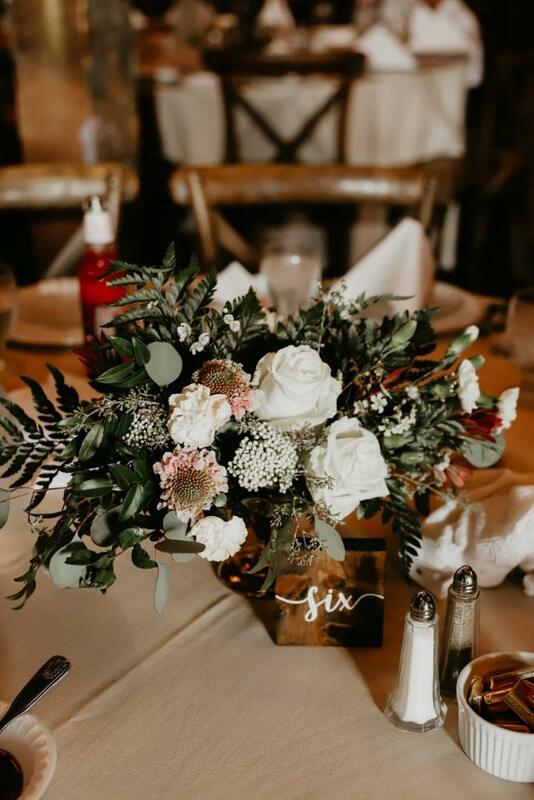 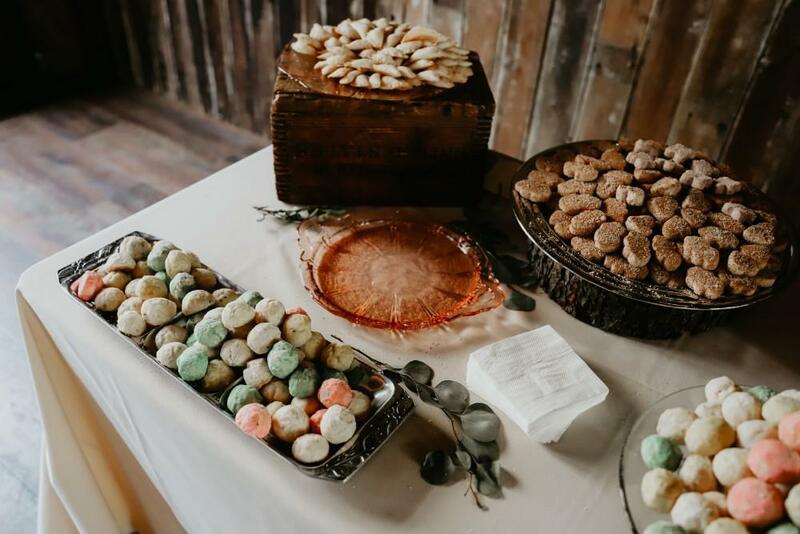 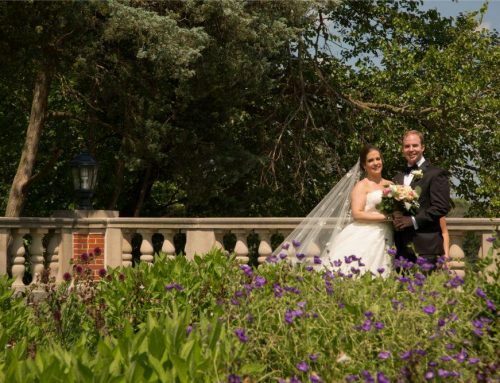 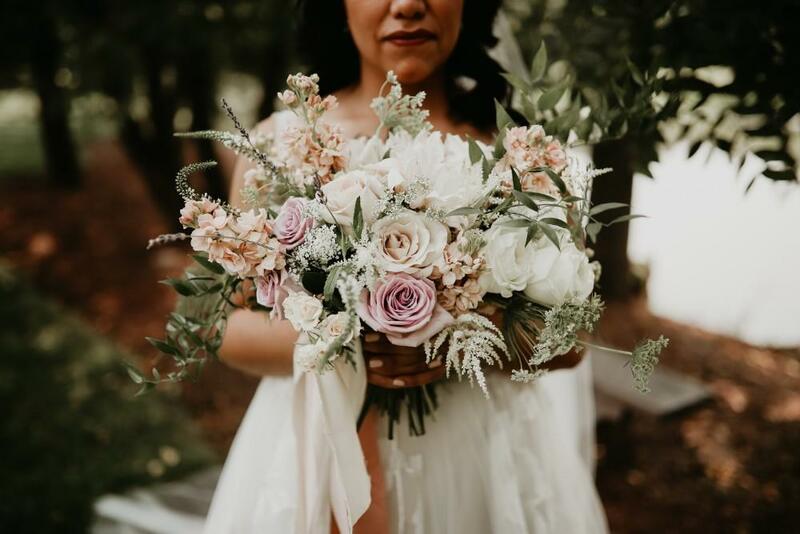 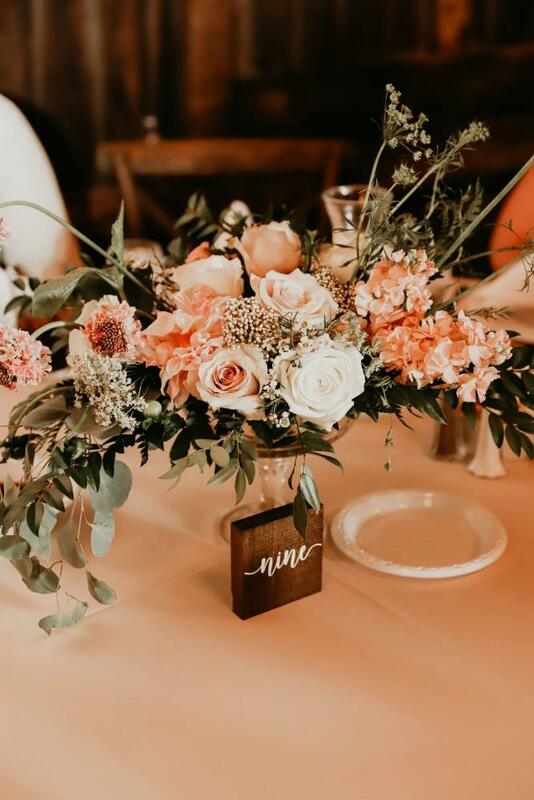 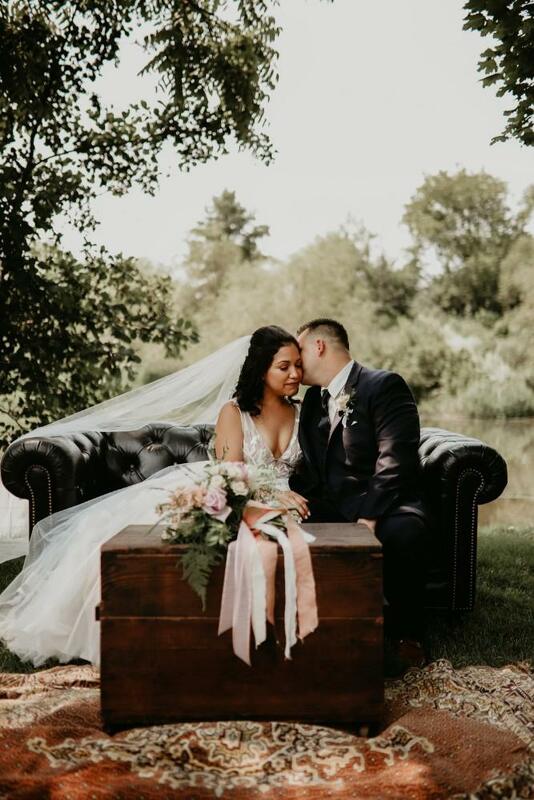 The rustic elegance of The Landing 1841 was the perfect setting for Mónica & Corey’s Big Day, complete with a mariachi band, surprise cigar bar, and pastries lovingly made by the bride and her family. 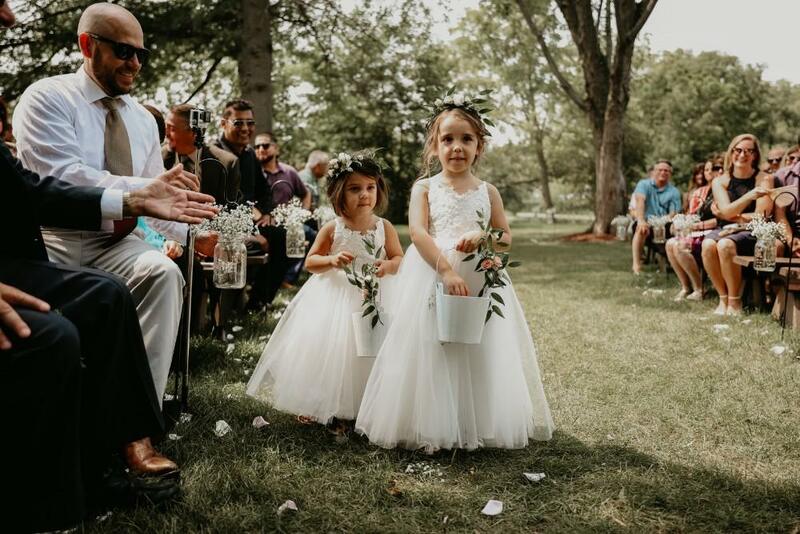 All photos by Megan Swederski Photography. 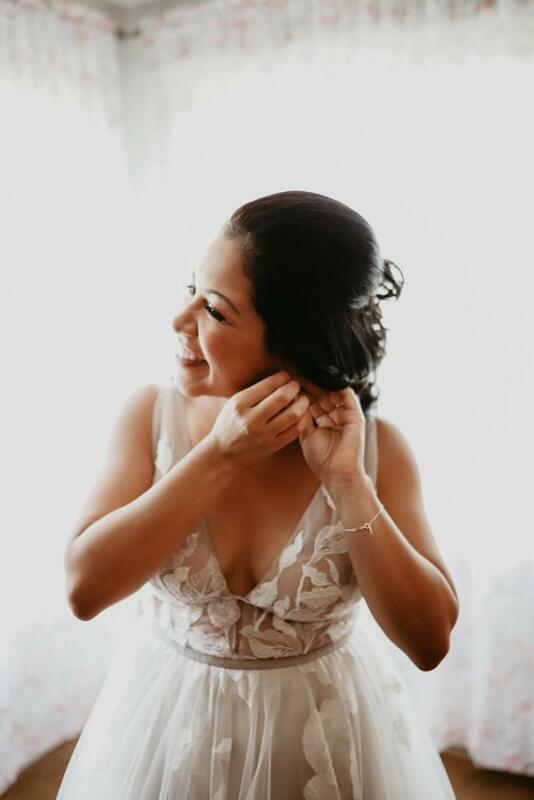 Mónica and her bridal party were thrilled to spend the morning getting ready in the spacious bridal house on the property. 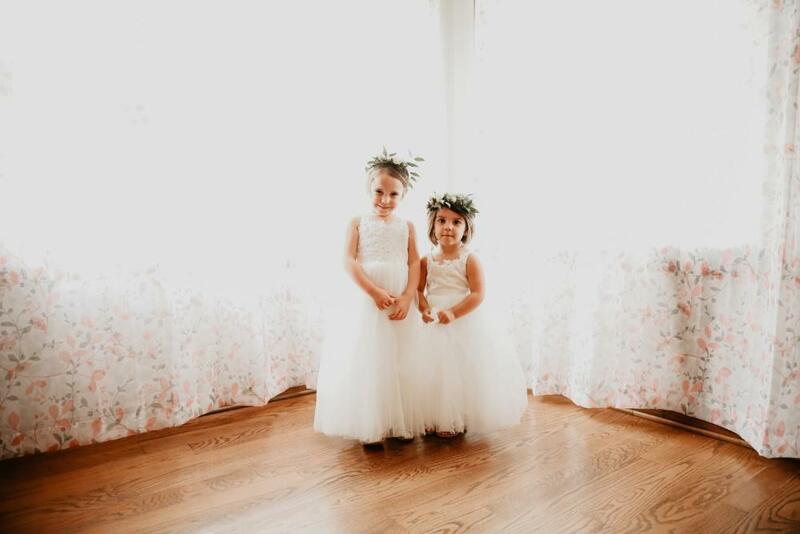 They spent the morning laughing and enjoying hair and makeup time together before the festivities began. 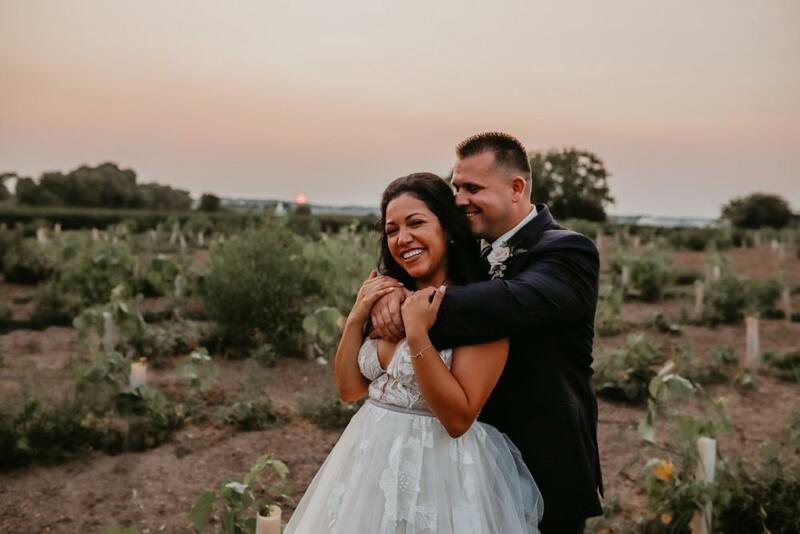 Mónica truly became a bride when she stepped into her romantic wedding gown covered in floral details— a perfect fit for the idyllic venue. 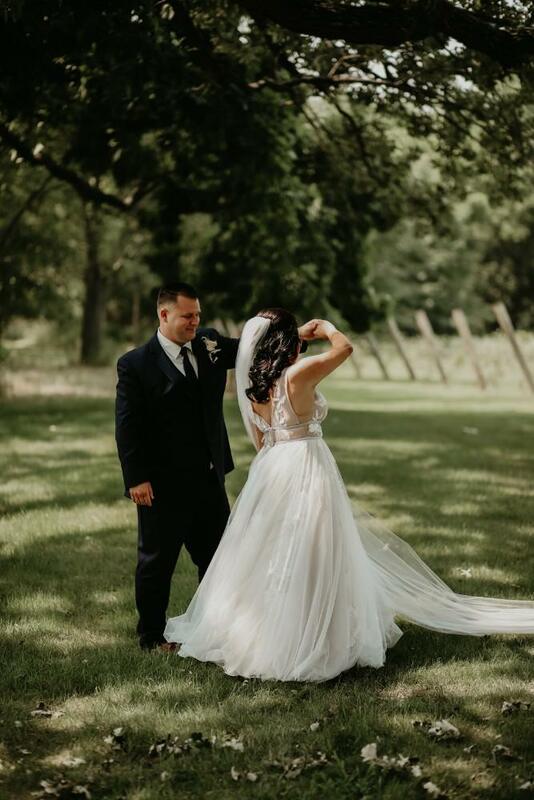 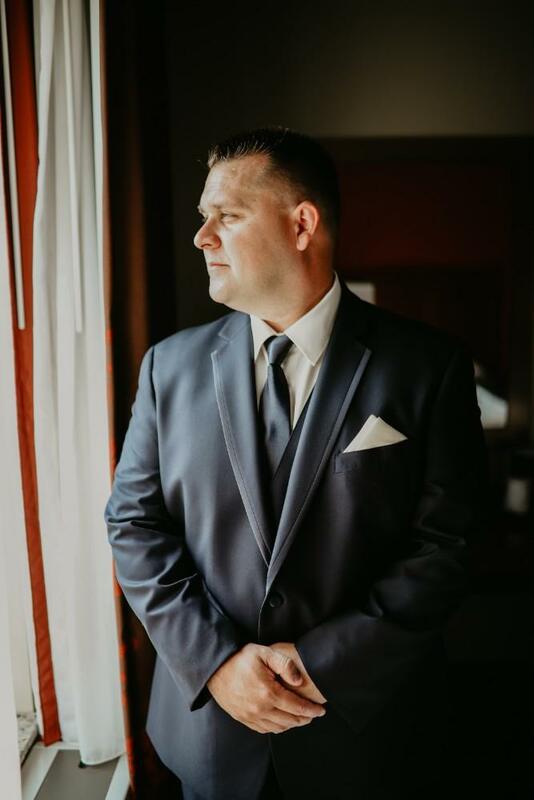 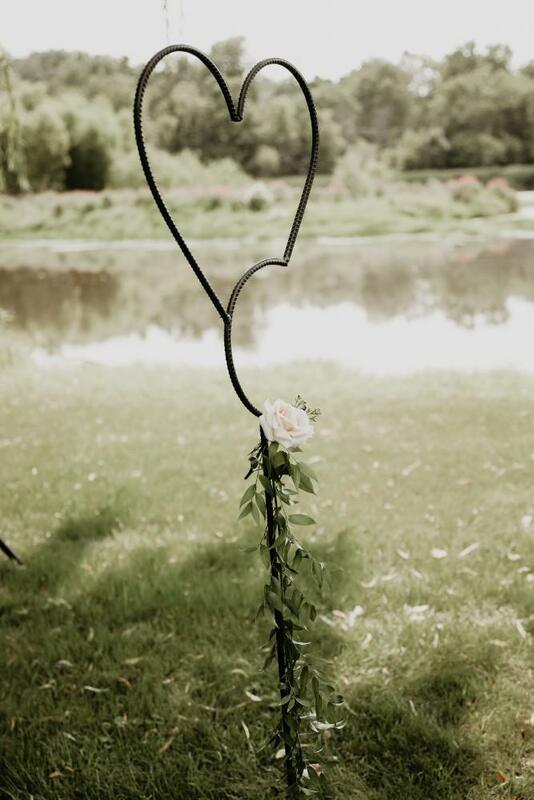 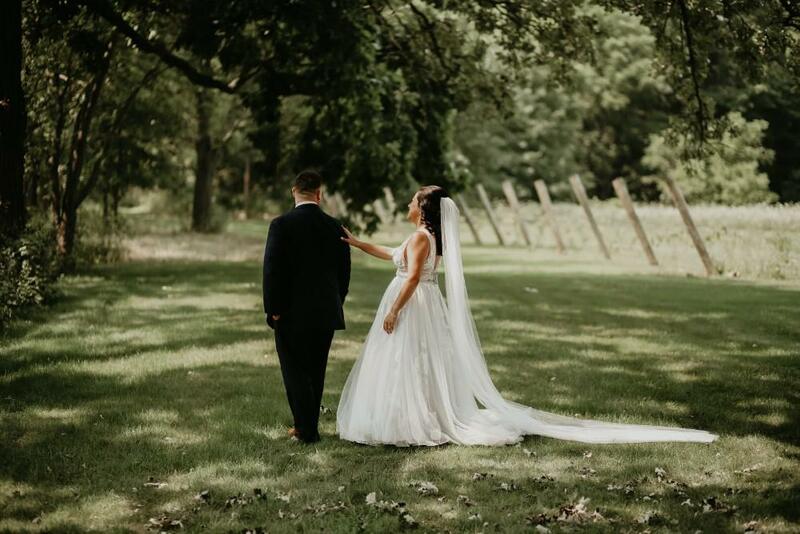 She and Corey met for their first look in a picturesque spot of The Landing 1841’s 50 acres and spent a few moments together before the ceremony. 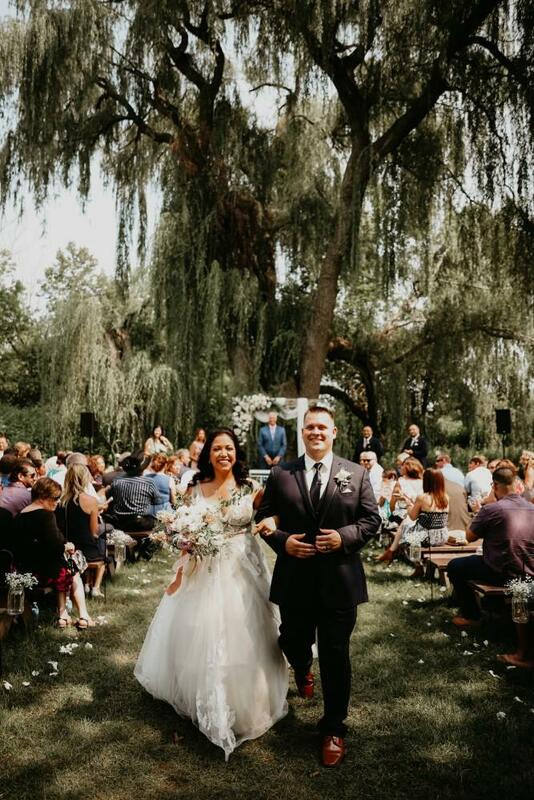 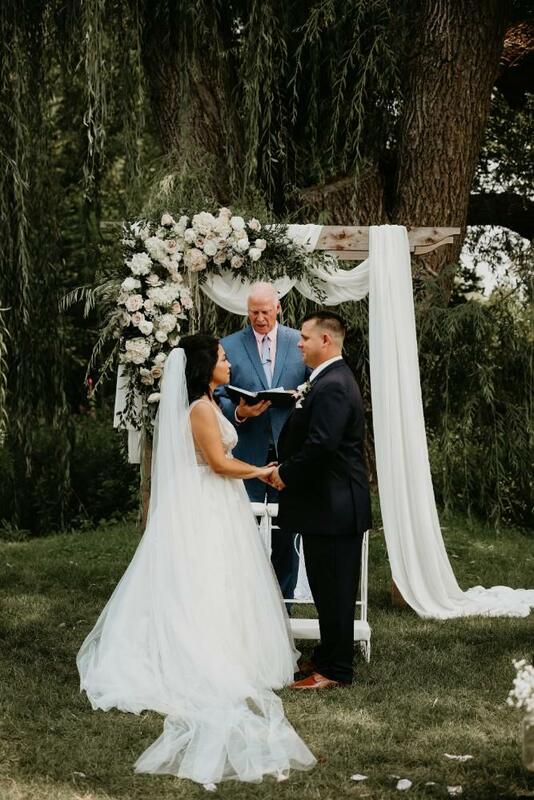 After first look photos, the pair was ready to exchange their vows underneath a willow tree next to the White River. 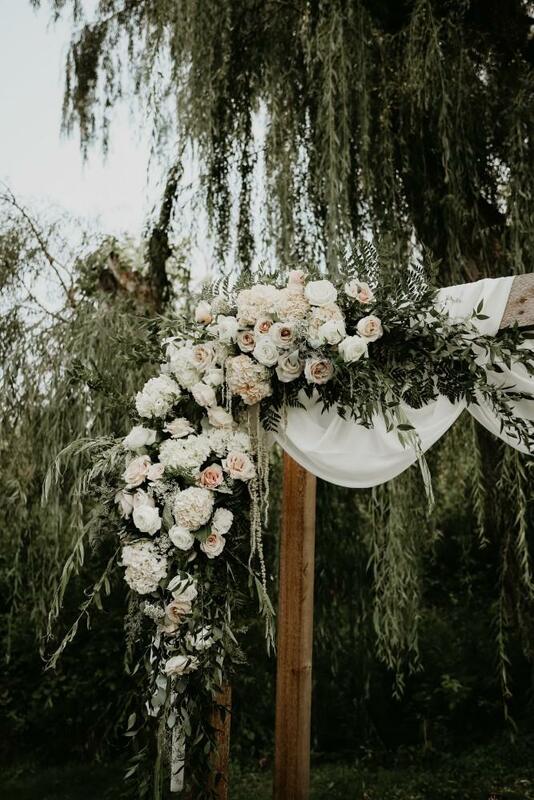 The romantic setting was highlighted by a gorgeous floral arch with soft white draping. 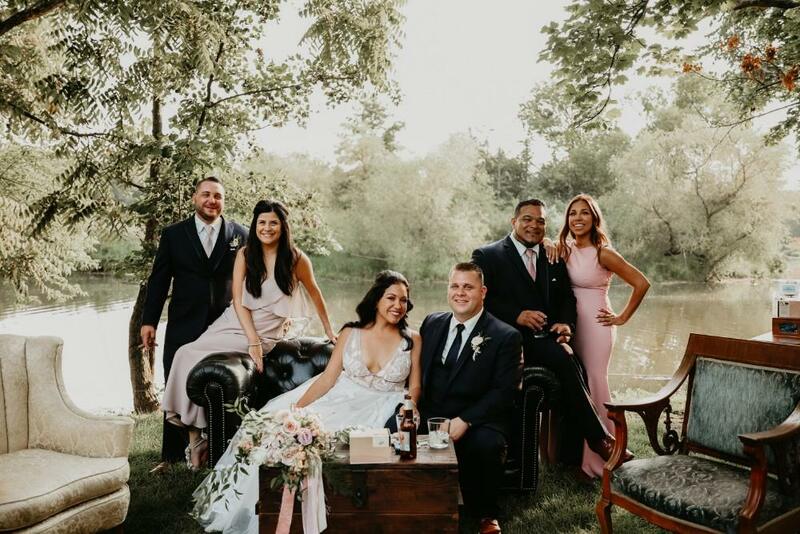 After the intimate ceremony, guests enjoyed an outdoor cocktail hour while being treated to the tunes of a live Mariachi band. 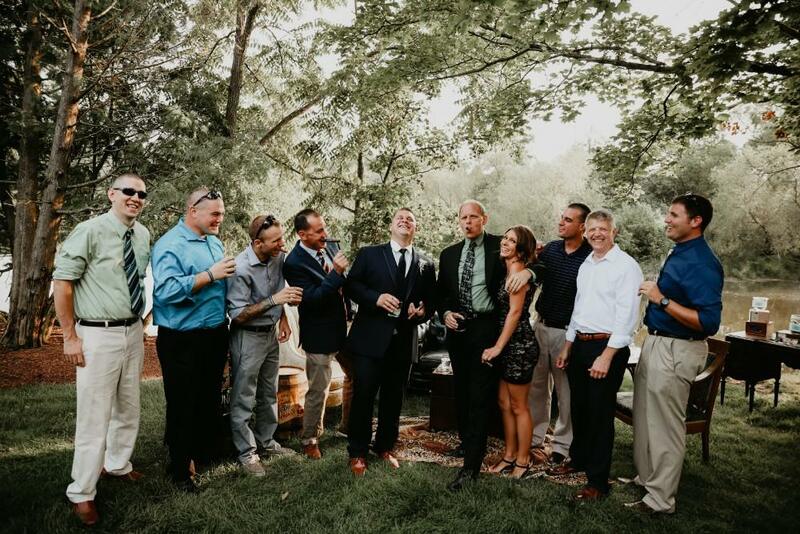 And as a special treat, Corey was surprised to find a customized cigar bar that Mónica had secretly arranged. 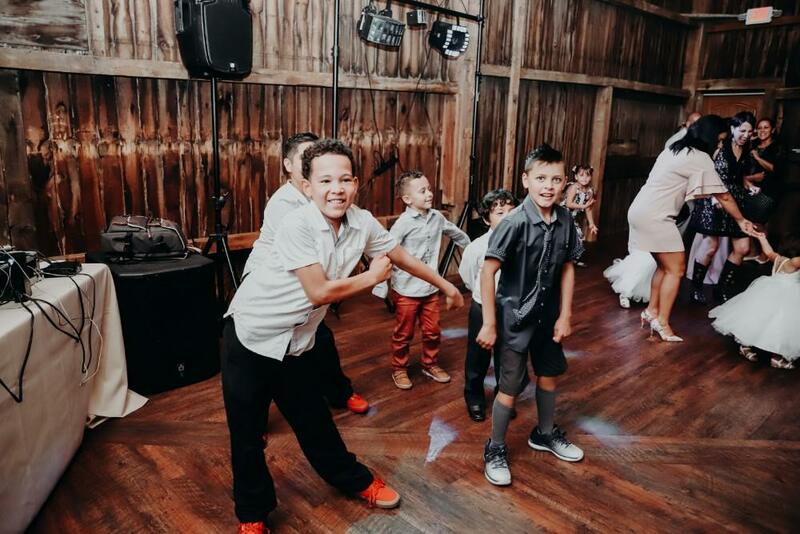 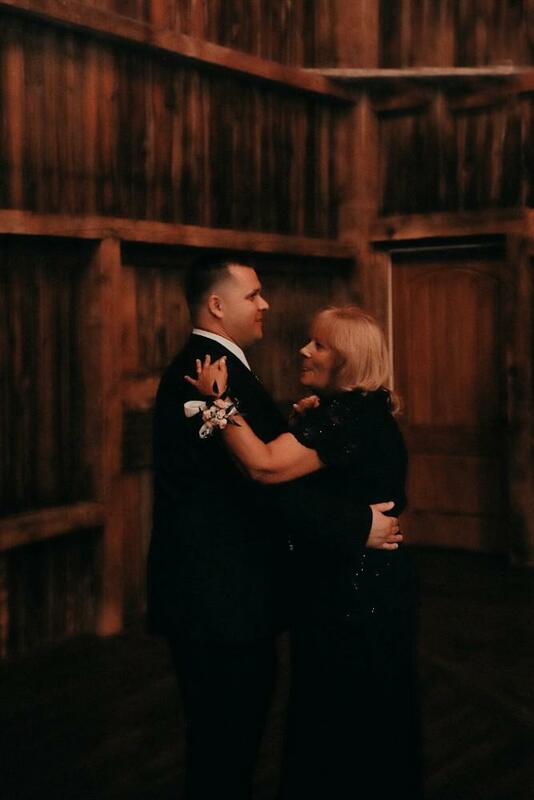 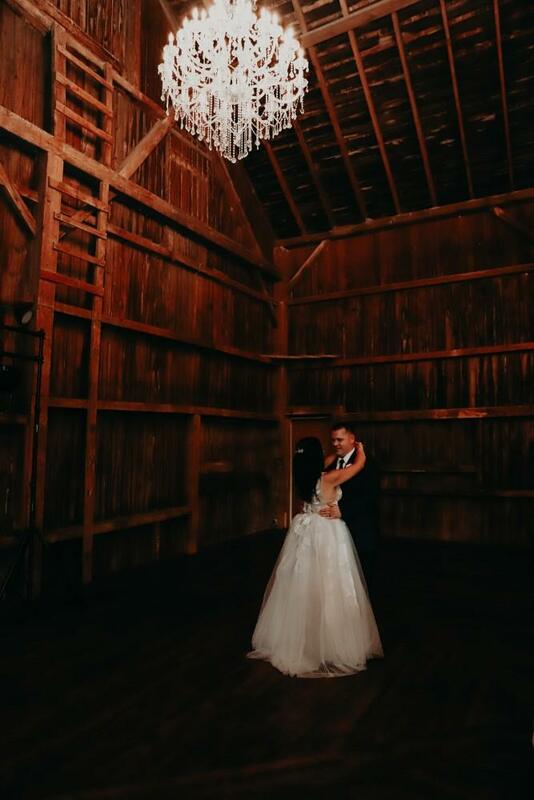 The reception continued with everyone moving into the elegantly rustic, renovated barn for a family style dinner and lots of dancing. 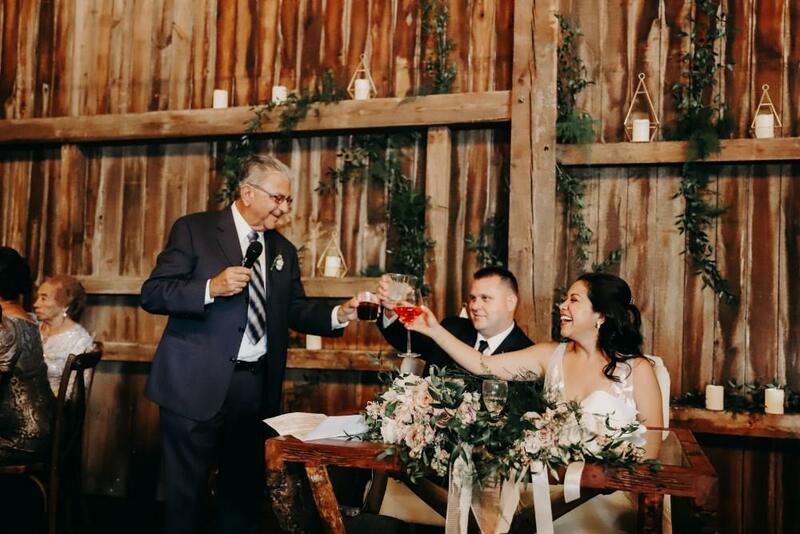 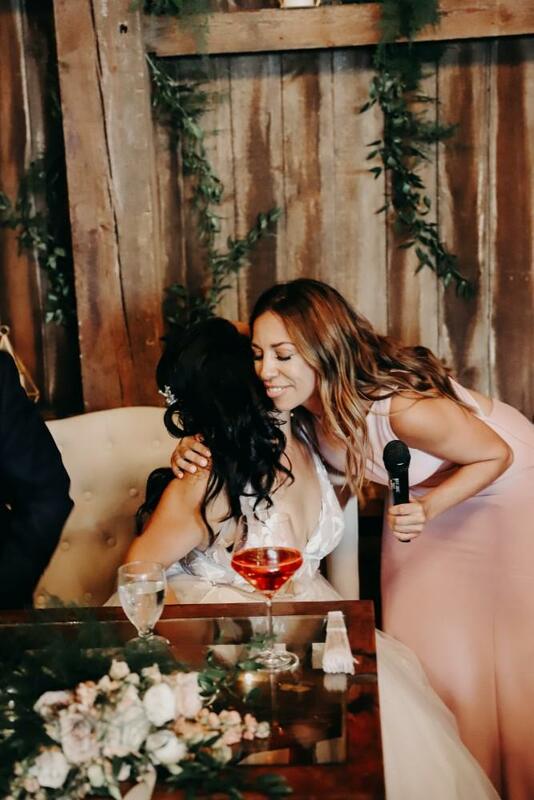 The entire event was filled with meaningful speeches and special personalized touches from both the bride and groom. 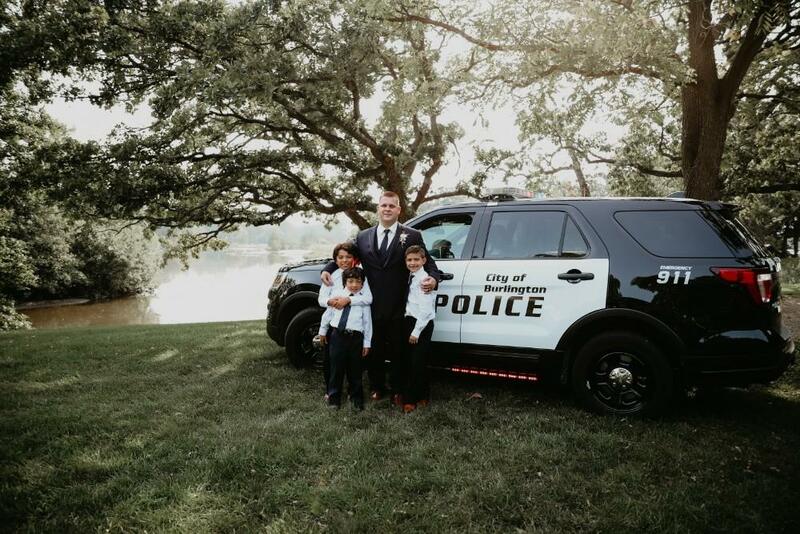 Corey (who works in law enforcement) arranged to have a Burlington squad car drive onto the property so Mónica’s nephews could explore a real police car. 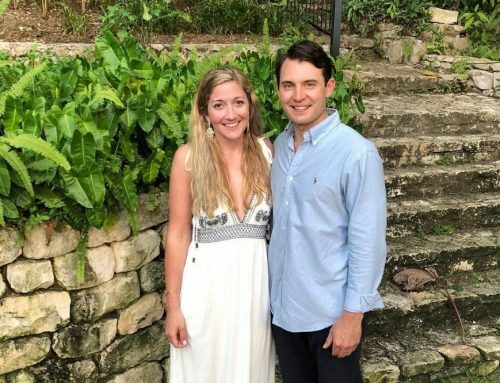 As a tribute to Corey’s career, the staff at The Landing 1841 had a blue line flag flying specifically for their celebration. 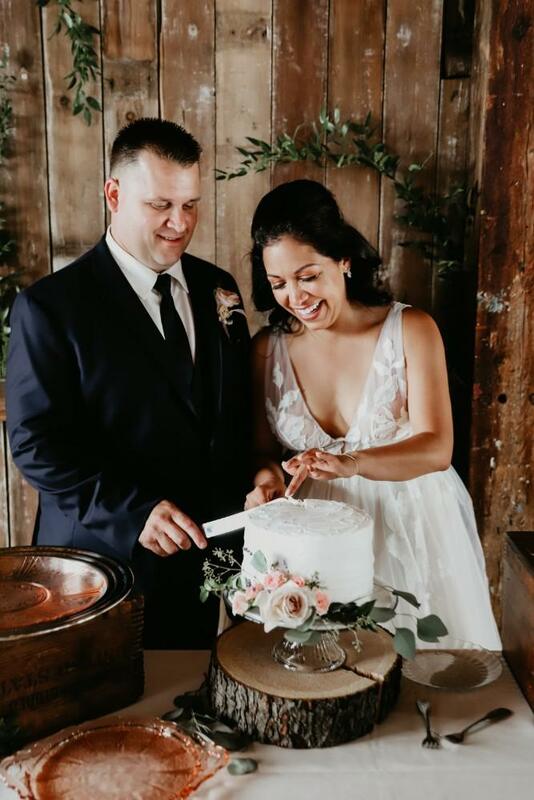 Along with wedding cake, guests were treated to homemade pastries that Mónica lovingly made with the women in her family before her Big Day. 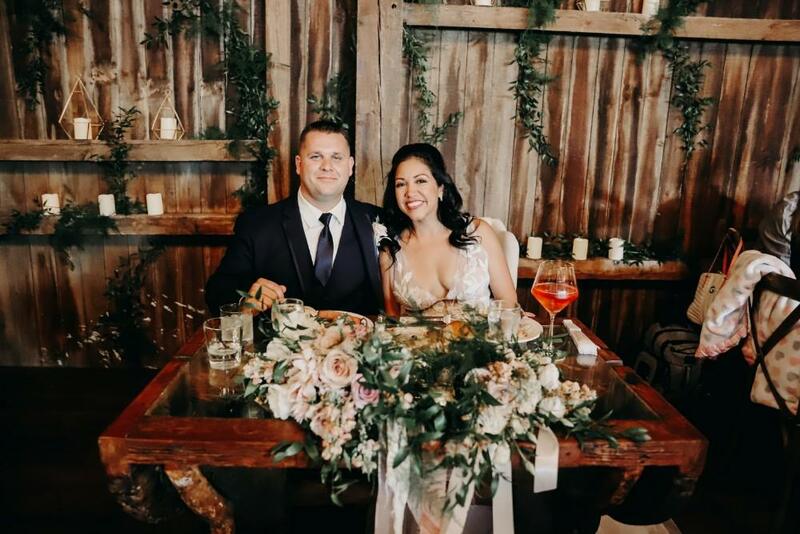 The couple had a fitting ending to such an exciting and fun night, exiting to an explosion of confetti and the love and well wishes of their closest friends and family. 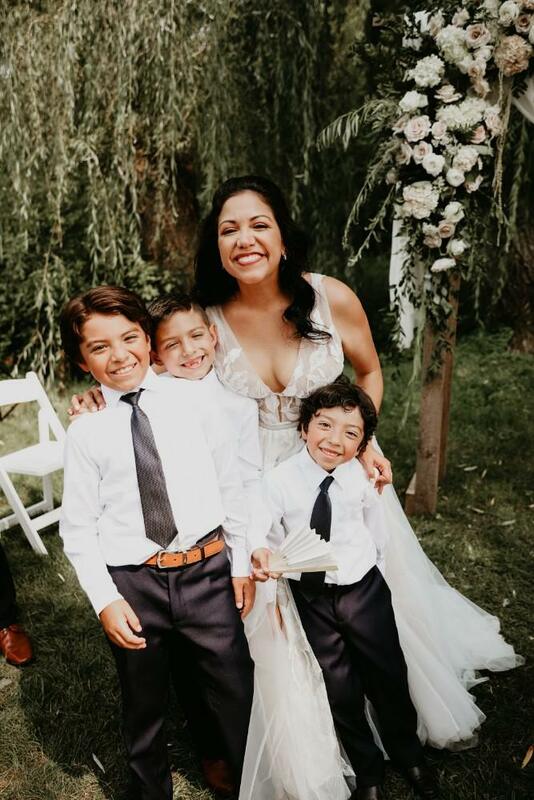 When looking back on the day, Mónica recalled the fun she had getting ready with her sister, best friend, and mom. 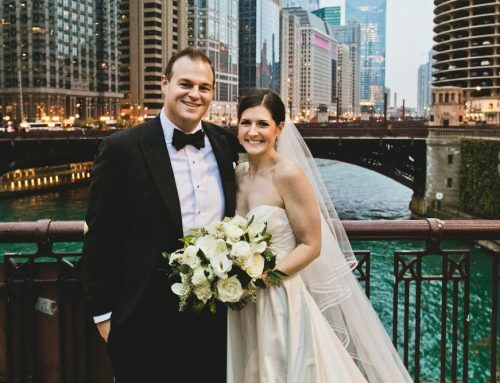 She also enjoyed the wedding ceremony, specifically, “Walking down the aisle with one of the most important men in my life, walking toward the other important man in my life, with all of our loved ones watching us.” Along with his favorite memory of seeing his beautiful bride for the first time, Corey most enjoyed the surprise cigar bar and the delicious brisket they had for dinner. 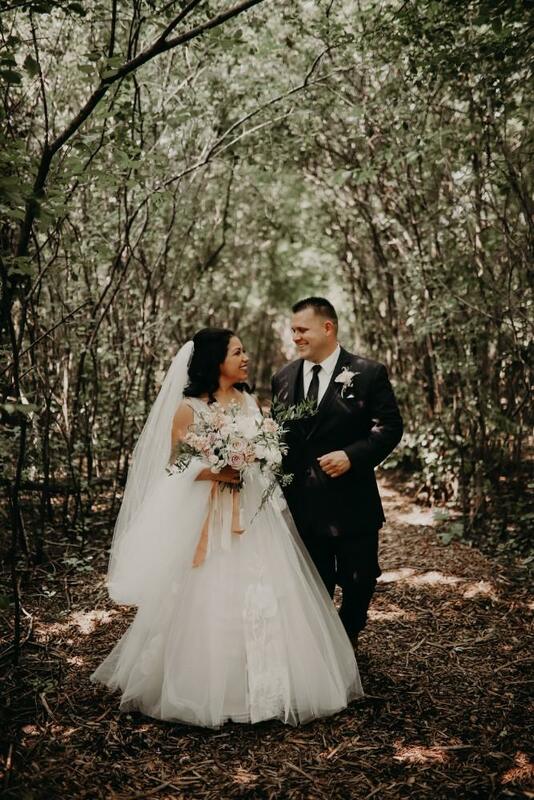 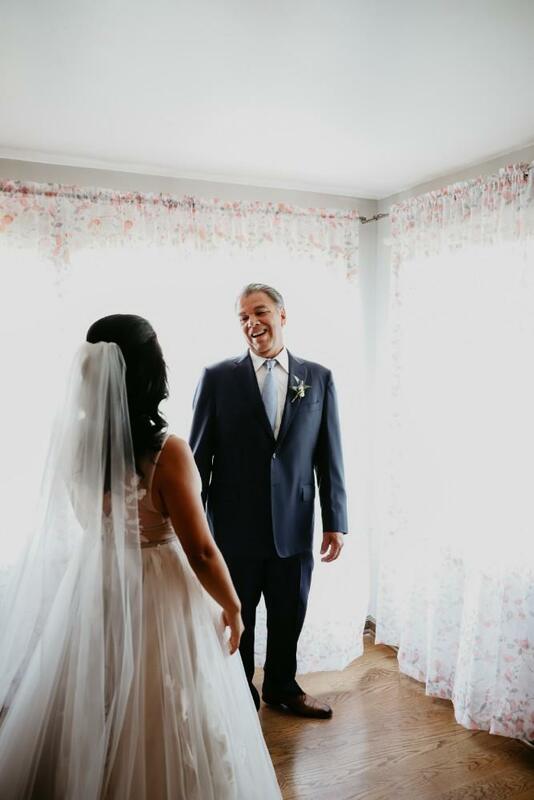 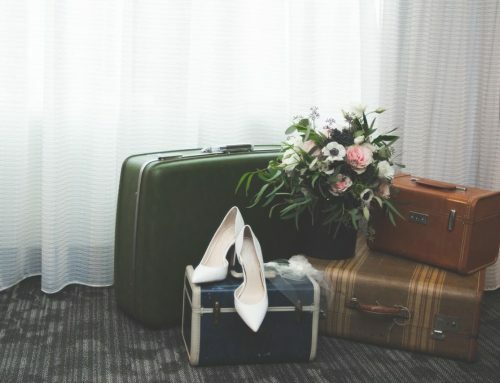 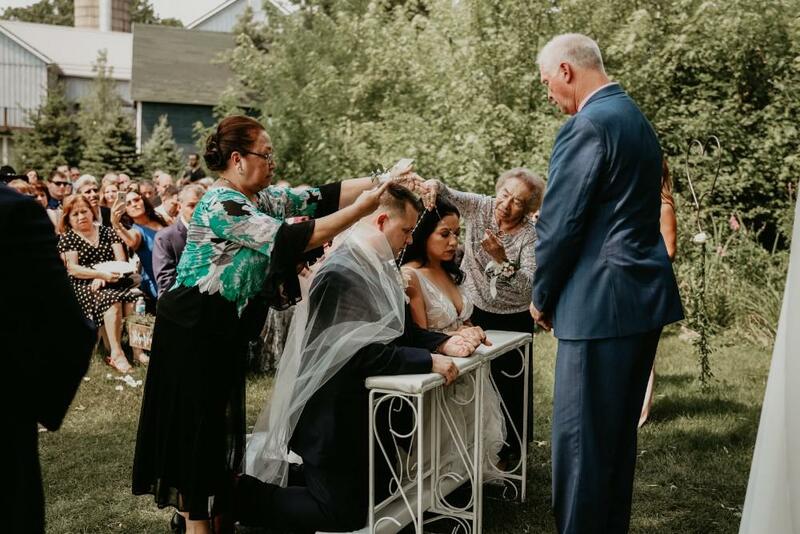 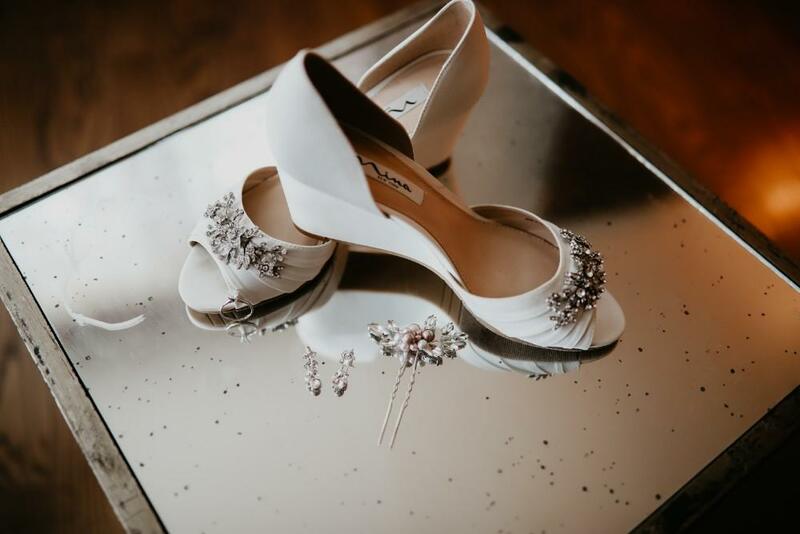 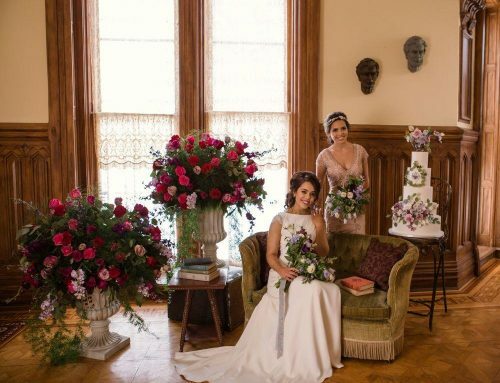 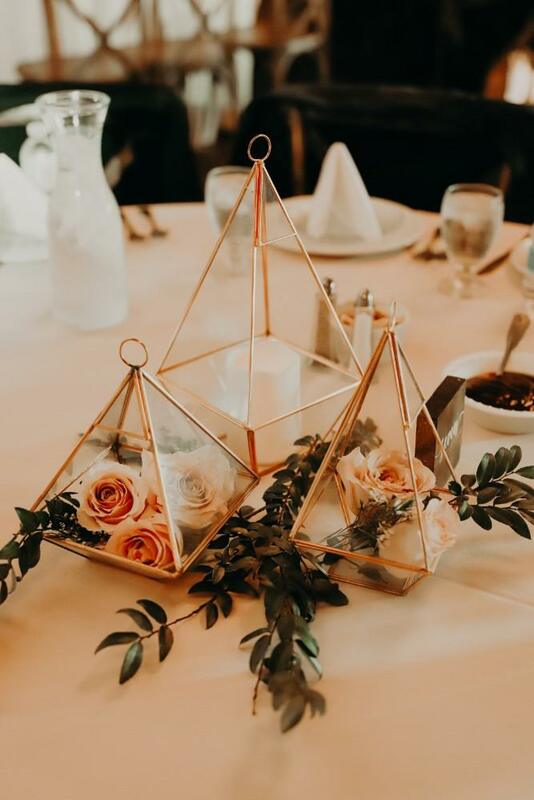 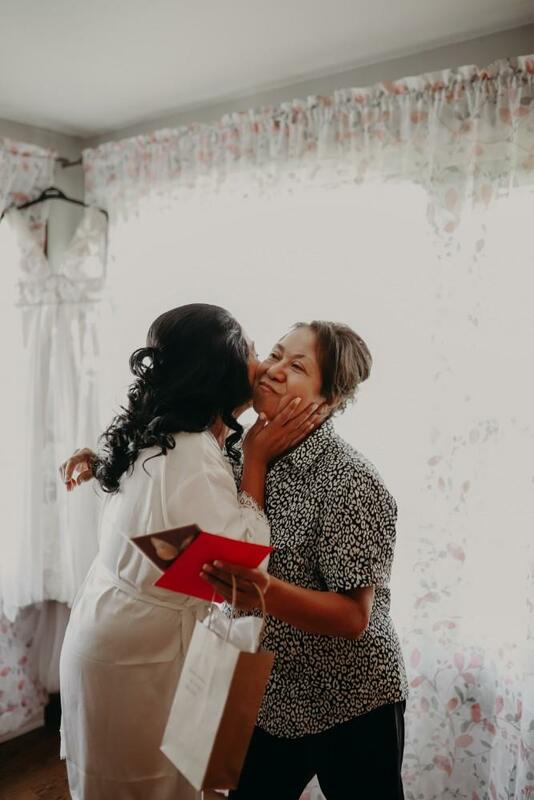 The pair treasured their wedding day for the time they spent together and the time they got to spend celebrating their love with family and friends.